This story originally appeared in the November 11, 2005 edition of the South China Morning Post (subscription only). The boy who has been dubbed the future of Chinese golf spends 11 months of the year in Florida, and he appears equally comfortable conducting interviews in English and Mandarin. Sixteen-year-old Hu Mu, the eighth-ranked junior golfer in the world according to Golfweek magazine, has a lot resting on his slight shoulders, he’s used to it. He’s been the future of Chinese golf since he was 11. Hu is the only amateur participating in the HSBC Champions tournament this week at Sheshan International Golf Club in Shanghai. He opened Thursday with a disappointing 6-over 78, closing with a triple bogey in the rain on the final hole. In 2001, at the age of 11 – three years after he started golfing — Hu won the China Junior Golf Open … in the 15-18-year-old division. Later that year he moved from Shenzhen to Florida, where he began training under renowned swing doctor David Leadbetter. He’s already won a handful of junior tournaments and played three times with the big boys on the Asian Tour, finishing tied for 11th at the Sanya Open in 2004. Hu said he’s just an “ordinary kid” to his friends back in Florida, but he’s got the professional golf world abuzz. Everyone knows about the teenager who’s being called China’s Tiger Woods – even Tiger Woods, who met Hu for the first time earlier this week. 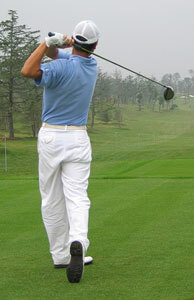 Hu has a quick, efficient swing and consistently drives the ball 300 yards. But it will be some time before golf fans get to watch him hit the ball on any kind of regular basis. Hu said he doesn’t plan to turn pro until he’s completed four years of college. Based on the crowd following Hu’s round on Thursday – a dozen or so fans — the Chinese are willing to wait on their future superstar. Tomorrow’s Tiger Woods isn’t much of a draw when the real one is sinking a birdie a few holes over. Another teen, 17-year-old Thai sensation Chinarat Phadungsil, joins Hu as part of this week’s field of 73. Last Sunday, he became the youngest golfer to win an Asian Tour event, with a playoff victory in the inaugural Double A International Open in Rayong, Thailand. And after arriving in Shanghai on Tuesday, he announced that he was turning pro. Perhaps having to pass up the Double A’s $47,250 victory check because of his amateur status didn’t sit well with the reigning World Junior Champion. Filed under Blog. Tagged china, danwashburn, golf, hsbcchampions, humu, scmp, stories, tournaments.